The ACROTORQ quarter turn electric actuators are now available with the spring return option for torque ratings up to 300 Nm and power supply voltages of 110/240 VAC 1 Ph, 440 VAC 3 Ph & 24 VDC. This option utilises a totally enclosed spiral spring connected in series with the actuator out-put drive. In the power on mode the motor drives the output shaft simultaneously compressing the spring. An electro-magnetic brake locks the output shaft preventing the spring from releasing its energy. On loss of power or in the ESD mode, the brake is released and the spring drives the actuator to a fail-safe position. Spring travel time is 2 secs. 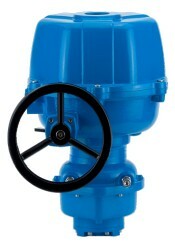 The addition of the spring return option to the Noah electric actuator range makes it a very reliable, economically priced and versatile actuator for on / off & position control for quarter turn valves & dampers.